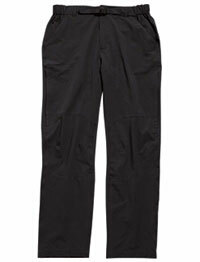 I've worn the Regatta Geo Extol trousers on numerous occasions now and I must say that I do really like them. They are really very comfortable plus the fabric is a little more substantial/harder wearing than often found in summer/lightweight walking trousers. There is also a side leg venting option which has been extremely welcome during some really quite hot weather. The fitting, however, is a little eccentric. I had to have a pair one size larger than usual. There is a belt supplied with the trousers but the design is such that part of this disappears into the part elasticated waist band. The main problem I found with this is that it's not possible to anchor a camera etc to the waistband which I did find to be pretty inconvenient. I'm not quite sure what happens if the belt becomes unthreaded plus it's not possible to use your own belt with them. There is a reasonable selection of pockets - one back zipped pocket, 2 hand warmer side plus one other side pocket. I did think that all the pockets were a little shallow. On the (important) plus side, though, the freedom of movement provided by the Geo Extols is very good indeed. There is little rain repellancy but they do dry really quickly. One final comment - the fly front opening is unusually short .... which can pose some difficulties! Whilst the Regatta Geo Extol trousers do have some some slightly quirky features, they are basically a very comfortable option for summer walking in all but the highest mountain terrains. Do check the sizing.